As superheroes pick their side kick with good care, so you should pick the right veggies and carbs for your meat, poultry or fish dish. Good side dishes (called Beilagen in German) will complement the flavor and texture of the main dish and combine nicely with gravy or other well-prepared sauces. Here you’ll find the most popular German vegetable sides (Gemüsebeilagen) and carbs (Sättigungsbeilagen – a term from former East Germany referring to the form of carbohydrates designed to help you feel full (“sättigen”) – along with great matching sauces and gravies. A rich and creamy bacon onion gravy from Germany that’s a traditional sauce for potato dumplings such as Hoorische or Gefillde. These German boiled bread, potato and egg dumplings get a head start from a dumpling mix that comes in a box. Made-from-scratch dumplings in an easy fashion with Zwieback and parsley. A great side dish to mushroom ragout with cream sauce. Lightly seasoned potato puree. piped into decorative mounds. Red cabbage braised with onion. apple and seasonings is a versatile side dish and the perfect accompaniment to Sauerbraten. 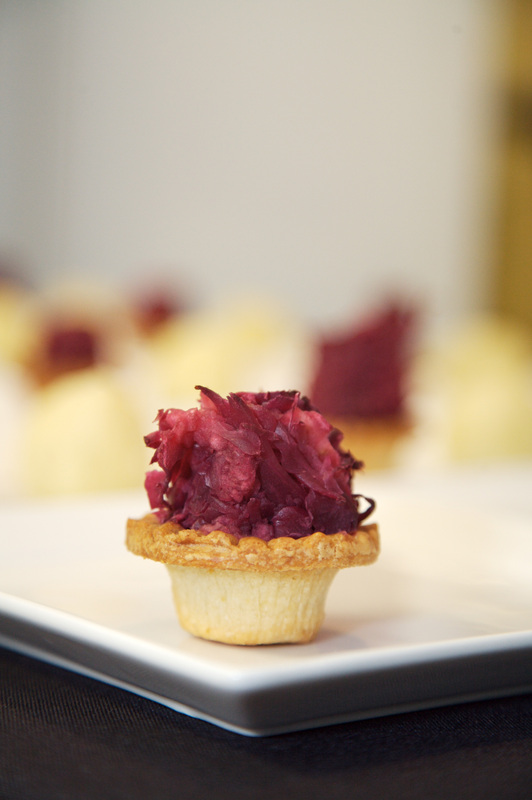 Chef Olaf uses a custom spice blend reminiscent of German gingerbread spice for this red cabbage recipe, transforming a fairy simple dish into the epitome of comfort food. Chef Olaf uses double smoked bacon for depth, and adds fresh apples,onions, and spices to balance the natural acidity of the sauerkraut. Tangy sauerkraut is tempered with creme fraiche for a side dish that complements roast chicken or pork chops. AJso great to top baked potatoes. White asparagus fried in a beer batter. then served with herbed cream sauce- a very German celebration of asparagus season . Crispy potato pancakes with an unpronounceable name from Germany’s Saarland region are flavored with leeks and onion. Serve with apple sauce or Bibbelsche Bohnesupp. Heaven (apples) and earth (potatoes) combine in this tasty side dish with bacon and onions. The name is derived from the 18th century word “Erdapfel” (earth apples) for potatoes. Packaged German spaetzle get a flavor boost from a brown butter and herb sauce 1n this versatile side dish. With variations such as Green Herb Spaetzle. Spaetzle are a type of egg noodles or small, elongated dumplings.A regional specialty of Swabia, Germany. – a historic region that crosses the southern states of Baden-Wuerttemberg and Bavaria. Zesty Bavarian horseradish nicely balances the sweetness of the squash and apples. for a recipe full of the flavors of harvest season. A traditional finger-shaped potato pancake recipe from the southwestern part of Germany. most commonly served sauteed until golden brown with onions, bacon and sauerkraut. Traditional German family dish of boiled potatoes in their jackets served with creamy quark and chives. A authentic German recipe for traditional Thuringia potato dumplings. Although there are only 4 ingredients, this recipe takes some practice to get right. In this variation of German potato salad, the marinade contains boiled onions and gherkins. Literally translated as “grated cakes,” these simple potato pancakes are also known as Kartoffelpuffer. An easy, basic German recipe. A crusty German potato cake cooked in a casserole dish with finely minced onions. eggs and spices. topped with bacon. Traditionally eaten around St Martin’s Day (November 11). The traditional German-Swiss variation of fried grated potatoes, similar to Reibekuchen or Kartoffelpuffer. A variations by Chef David St John-Grubb. Classic German recipe for red cabbage cooked with sweet and sour flavors. Chef Olaf created this side dish recipe to help people fall in love with the mild, broccoli-like flavor of kohlrabi. Spinach spaetzle are a perfect complement to venison or any other roast meat. Recipe from Master Chef Peter Schaffrath, Hay Adams Hotel, Washington DC. Braised spiced plums with wine and brandy makes a side dish that adds some extra spiff and flavor to meals featuring turkey. pork, duck or beef . A slaw with texture and depth made from fresh shredded cabbage, sauerkraut. apples. walnuts. and a warm dressing . A side dish or salad of blanched white asparagus and fine German Black Forest ham, with avocado, tomato. basil and chives and an oil and vinegar dressing . This variation of classic Italian pesto uses wild garlic (also known as rampson or ramps, called Bärlauch in Germany, where it rapidly gained popularity.